Offering you the highest quality product at the lowest possible price since 1975! LAKELAND TRUCK CAPS Built right here in Wisconsin! 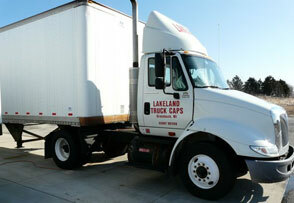 Offering you the highest quality product at the lowest price has been the way of doing business at Lakeland Truck Caps a family owned and operated manufacturer since 1975. During that time we have become Wisconsin's Largest Truck Cap and Tonneau Cover Manufacturer. Purchasing materials in large quantities at reduced prices plus our efficient manufacturing methods produce a top quality product at an unbeatable value. We save you even more by eliminating the middleman/dealer. That’s right, you are dealing directly with the manufacturer. We offer Lakeland Truck Caps and Tonneau Covers to you at factory direct savings through our outlet stores in Wisconsin. You've seen Lakeland Truck Caps and Tonneau Covers on the beds of thousands of satisfied truck owners. When you compare our quality, fit and our factory direct savings, you'll see for yourself why you’ll want a Wisconsin built Lakeland Truck Cap or Tonneau Cover for your truck. All Lakeland Fiberglass Truck Caps and Tonneau Covers are finished with a two-step basecoat-clearcoat automotive paint like that used on most new vehicles today. Our state of the art painting facility produces a deep, high gloss, durable automotive quality finish. With minimal care, your Lakeland Truck Cap or Tonneau Cover will maintain its beauty for many years to come. In addition, all Lakeland Truck Caps and Tonneau Covers are constructed using high quality, no compromise components. Top quality polyester resins and fiberglass provide added strength and increased durability. Should the need for service ever arise, we can provide you with fast professional service. No one knows more about their product than our staff. After all we are the manufacturer! With over 35 years of experience manufacturing Lakeland Truck Caps and Tonneau Covers, you can count on our commitment to high quality and our assurance that your Lakeland Truck Cap or Tonneau Cover will be an exceptional value both today and years to come. WHY PAY HIGH RETAIL WHEN YOU CAN BUY FACTORY DIRECT! Built for you right here in Wisconsin!